This book review originally appeared in Baltimore, Washington and Philadelphia SmartCEO Magazine June issue. Nearly six years ago I wrote a blog post about my fascination with the simplicity of music. Think about it, there are only 12 notes in music (and from what I understand only 5 notes are used 80% of the time). Despite that we can enjoy music as complex as Bach and Beethoven, as simple as a Cars tune, as mind numbing as The Grateful Dead or Pink Floyd and as rocking as a Springsteen or Gun 'N Roses anthem. In twenty years working with more than 1,500 small and mid-market companies, I've learned that business and music have an awful lot in common. Building a successful, highly profitable growth business is a complex result; however, the process of getting there is a simple one. The most common reason businesses fail to reach their potential, and instead stall, is because the entrepreneur or business leader embraces too much complexity. Companies are constantly trying to "differentiate" themselves. They are constantly trying to "add value" and "innovate." Too often, companies make things complex for the sake of making things complex. Sure, they claim the complexity is necessary so that their clients and prospects will understand how they are different. They say their solutions are complicated and they don't want to "dumb things down." The reality is that the complexity merely commoditizes them in the marketplace and confuses the people inside the business. Just as John Williams used only five simple notes to compose one of the most memorable and intense themes (Star Wars), the key for business executives is to find the simple rules that will guide every aspect of their decision making. 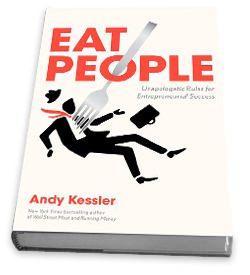 With those thoughts in mind, I came across Andy Kessler's most recent book: Eat People: And Other Unapologetic Rules for Game-Changing Entrepreneurs. For those that don't know Kessler, he's an enigmatic, contrarian ex-hedge fund manager. If that description hasn't turned you off, it's a good bet you'll enjoy his books. Kessler is one of my favorite business authors for three reasons. First, he is the prototypical cynic; second, he takes nothing for granted and investigates everything; and third, he is an entertaining writer. In Eat People, Kessler investigates the cause for the massive wealth creation he has witnessed. He calls these wealth creators "Free Radicals" as they operate outside the norms of business and create great wealth for themselves and for the greater society through the impact their endeavors have. He shares 13 simple rules that should be followed by anyone desiring such success. Kessler has spent most of his life making money in the technology sector and his rules are geared to the technology industry. While his stories are entertaining, the real value is not the rules he comes up with, or the stories he tells (though they will make you a hit at the next cocktail party); it's the process he used to come up with his rules and in how he applies his rules to make decisions. Success in business requires three key components: effective systems, the right people to support those systems and the tools/resources that support the people and the systems. Management guru W. Edwards Deming taught that every business problem, at its heart, is a systems problem. Yet most businesses treat everything as a people problem. Kessler doesn't teach a business system in Eat People, but he goes a long way to making the extraordinarily complex, remarkably simple. And that may be the most difficult task in business.